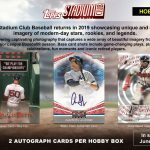 Blog Homepage \ Baseball \ Product Preview: 2019 Topps Heritage Baseball coming next February! 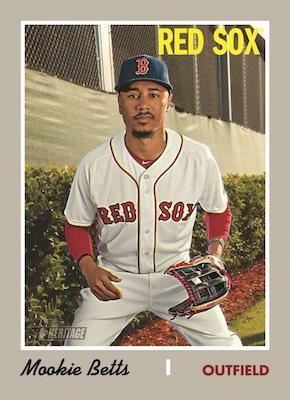 Product Preview: 2019 Topps Heritage Baseball coming next February! We have just received pre-order information and details on one of our favorite baseball releases of the early season – 2019 Topps Heritage Baseball. This is always a popular release as it offers a nice vintage design and feel along with modern elements like autos and relic cards. Paying tribute to MLB stars past, present, and future, let’s take a look at this February releasing product! As in past releases, 2019’s inspiration comes form the 1970 Topps Baseball design. The base set consists of a whopping 500 cards including 100 high-number short prints! The familiar Black Border (50 copies) and Flip Stock (5 copies) parallels are again exclusive to hobby boxes. Collectors can also chase after chrome parallels for 100 players that add Refractor (#/570), Black (#/70), Gold (#/5; hobby exclusive) and SuperFractor (1 of 1) versions. Hobby-only Action Image Variations and Team Name Color Variations are back along with the tough pull Throwback Uniform Variations. New for 2019 are the Silver Metal Base cards, numbered to just 70 copies each and Base Mini cards, numbered to 100. 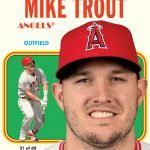 2019 Topps Heritage Baseball sticks with standard themed insert sets like Baseball Flashbacks (1:20 packs) – focusing on MLB moments from the 1970 season – as well as News Flashbacks (1:20 packs), for other newsworthy events from the year. 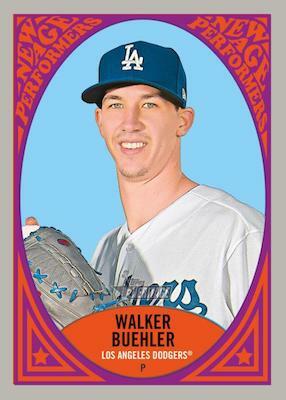 New Age Performers (1:12 packs) highlights modern stars of the diamond with an old-school design. A personal favorite Then and Now (1:20 packs) compares the stats of a 1970 star with a modern day player. There is also the 1970 Topps Scratch-Offs (1:24 packs) insert, paying homage to the original cards some collectors will remember from the 1970 set! 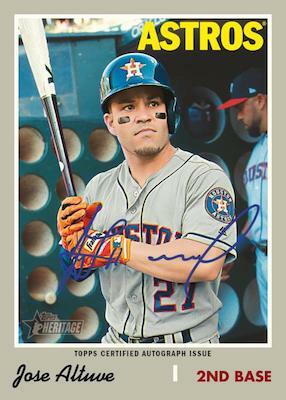 2019 Topps Heritage Baseball promises many on-card signatures. Base versions are signed in blue but die-hard collectors will be chasing the Real One Special Edition cards which use red ink and are hand-numbered to 70 copies or less! Other autograph options include Real One Dual Autographs and Real One Triple Autographs. A treat for Milwaukee Brewers fans, the on-card Brew Crew Autographs (100 copies) feature several players from their 1970 inaugural season! The hard-signed cards finishes with a few autograph memorabilia sets. 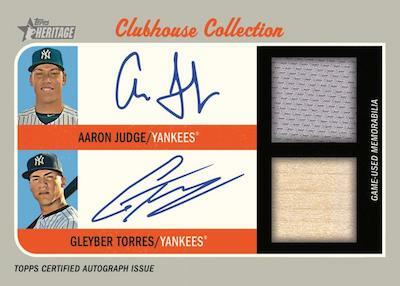 This includes Clubhouse Collection Autograph Relics (#/25 or less), Clubhouse Collection Dual Autograph Relics (#/10 or less; hobby exclusive) and Flashbacks Autographed Relics (#/25 or less). Each has a 1 of 1 patch parallel that is exclusive to hobby boxes. Rounding out the autographs, collectors can once again find Cut Signatures (1 of 1) of both baseball and celebrity stars! 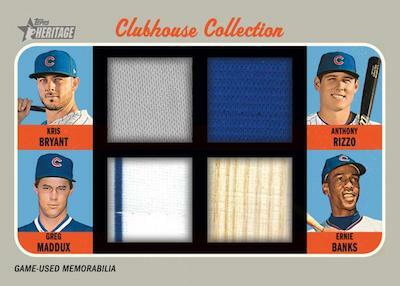 The Clubhouse Collection Relic line is synonymous with Topps Heritage Baseball and 2019 will be no different! Single, Dual (#/70), Triple (#/25) and Quad (#/10), Patch (1 of 1; hobby exclusive) relic editions are available. Single-player relic cards also have a Gold (#/10) parallel. 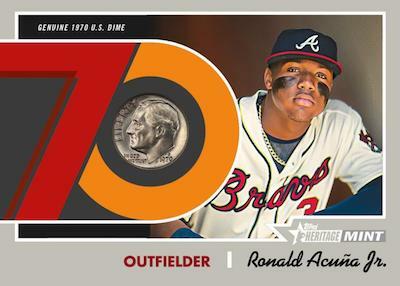 Joining these are the very cool hobby exclusive 1970 Mint cards with U.S. coins from that year alongside past and present players. Versions include Nickel (#/15), Dime (#/10), Quarter (#/5), and Half-Dollar (1 of 1). 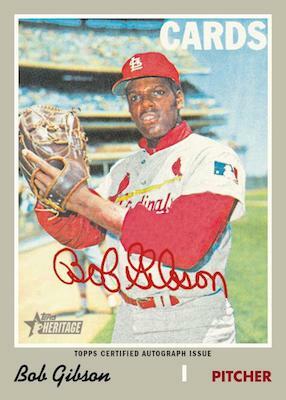 Likewise the 1970 U.S. Postage Stamp Relics (#/50) set pairs a player and a stamp from 1970. Finally box toppers are found exclusively in hobby boxes. Once again featuring the 1970 design, collectors can find the oversized 1970 Topps Super Baseball cards, as well as 2019 Topps Teammates (70 copies) and 1970 Poster Box Loader (70 copies). The 1970 Topps Originals cards are stamped buybacks from the original set. These all combine to fall one per hobby box. 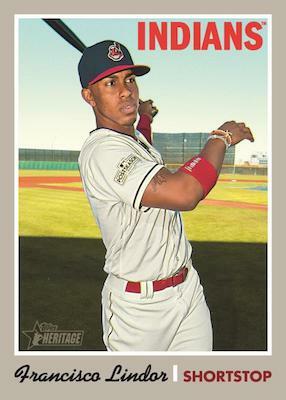 2019 Topps Heritage Baseball is poised to steel the minds of collectors this Winter when it releases in February. An early Spring Training release to wet the appetite for the new season! Lock in your presell price today – boxes (24 9-card packs per box) and cases (12 boxes per case) are now up for order on our website! Heritage Baseball is scheduled to make its first pitch for 2019 on Wednesday, February 27th. 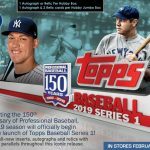 Product Preview: 2019 Topps Baseball Series One out in January with Silver Packs! 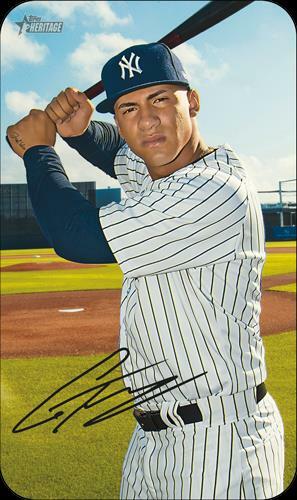 Product Preview: 2019 Topps Tribute Baseball coming this winter! 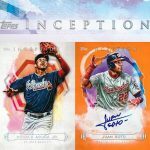 Product Preview: 2019 Topps Inception Baseball releasing in March! MLB Rookie Update: Jose Abreu is on Fire! Product Preview: 2018/19 Topps Chrome Premier League Soccer debuts on the pitch this Winter! Product Preview: 2018/19 Upper Deck SP Game Used Hockey out in January!